Flaming Lips released their cover of Dark Side of the Moon this past Saturday on vinyl. We were in Poughkeepsie to see them at a small intimate venue. Wayne walked over the audience in a bubble to start the show. They did all of their usuals like Yoshimi, The Yeah Yeah Yeah Song, Do You Realize? ?, along with a lot of chill-out psychedelic experimentation. Before the show ushers passed out handfuls of laser pointers. Then, Wayne asked everyone to take them out and point them at him with the lights off. He held up a large mirror and shot the beams back at the audience through show smoke. It was a really amazing moment. I'd be surprised if Mr. Coyne isn't blind from all the beams in his face. He then put on the giant hands with high power green laser beams in the palms. 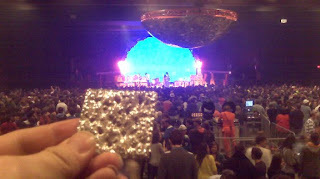 He swept them over the audience up to the enormous half disco ball where the beams scattered in every direction. The Flaming Lips make great tunes, but their show is pure performance art.